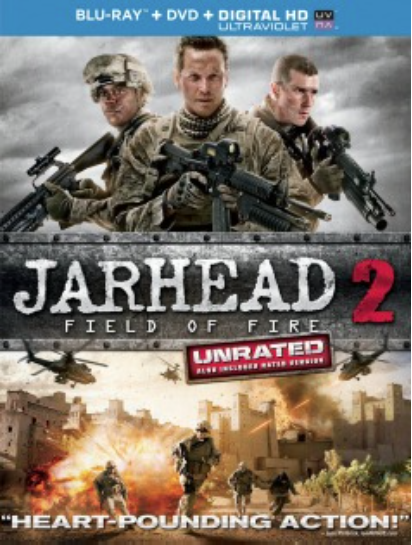 Don Michael Paul‘s Jarhead 2: Field Of Fire is a fascinating movie–which shouldn’t be mistaken for good, though it’s by no means terrible–that revolves around a platoon in Afghanistan and a mission circumstance forces them to undertake. What makes the movie so interesting is that it’s as if the makers had never seen the original film that their movie is (supposedly) based upon. The original Jarhead starred Jake Gyllenhaal and was based on the story of Anthony Swafford, and the American response to the Iraqi invasion of Kuwait. Though most importantly Jarhead was less a war movie than one about the nature of war, which was depicted as long lengths of time either doing nothing or doing things that appeared on the surface to be pointless, punctuated by an occasional bout of violence, till everything was defined by the same monotonous routine. Field Of Fire takes an opposite tack, as Josh Kelly (Chris Merrimette) and his platoon are forced to fight to defend the life of a mysterious woman who’s being transported by Navy Seal Fox (Cole Hauser). There’s no pointlessness of violence here, though the movie does try to adapt the somewhat cynical tone of the original film, for the most part unsuccessfully. This pointlessness extends to the rest of the movie as well, which besides conflict has little in common with the original film. Posted in actors, directors, Movies, Netflix, review.Tagged Anthony Swafford, Chris Merrimette, Cole Hauser, Don Michael Paul, Iraqi invasion, Jake Gyllenhaal, Jarhead, Josh Kelly, Kuwait, Netflix.